In January, I discussed the pros and cons of sub-$250 Chromebooks. In that article, I noted that Microsoft was offering PC vendors free licenses to install Windows 8/8.1 on low-cost machines, in an effort to claw back market share from Chromebooks powered by Google’s Chrome OS. That deal extends to Windows 10, and prices of so-called“Chromebook killers” are plummeting. Acer just announced a new line of Aspire One Cloudbooks with Windows 10, starting at just $169. Hardly a stunner in terms of specs, the Cloudbook 11 sports an 11-inch screen, 2GB of RAM, and 16GB of local storage. HP’s Stream 11, priced at $230 last November, is now going for $179 on Amazon. It comes with Windows 8.1 but upgrading to Windows 10 is free. And the DigiTimes Research market intelligence firm reports that Microsoft will launch their own Windows 10 laptops, priced at $149-to-$179 this summer. The hardware specs of these cheap Win 10 machines are comparable to similarly priced Chromebooks. Integrated chipsets such as Intel’s Bay Trail system strike a compromise between performance and power consumption. You won’t be doing processor-intensive tasks (e.g., managing large databases, photo/video editing, online gaming) on these machines, but battery life is exceeding 8 hours in some cases. Displays are only 11.6 inches diagonally, with middling resolutions that won’t do justice to full HD videos. Most Chromebooks have similarly small screens, but 13 and 15 inch displays are also available for less than $250. If the 11-inch Win 10 laptops are accepted by consumers, larger screens will surely follow. Microsoft is pushing Win 10’s cloud-computing features hard. The Cloudbook from Acer is billed as “made for the cloud.” It comes with a one-year subscription to Office 365 and a terabyte of Microsoft OneDrive cloud storage space. The low-end Cloudbook comes with only 16 GB of local storage space, pretty much forcing users to sign up for a Microsoft account for access to cloud services or pay more for 32 or 64 GB of local storage. Of course, once the free trial period ends, Office 365 and OneDrive will become recurring costs. That combo costs $10 per month or $100 per year, which could quickly eclipse the cost of the laptop. Of course, there's always Google Docs/Drive (cloud-based), and Libre Office (desktop-based) which are free. But Microsoft and the PC vendors who are offering these Windows laptops won't ever steer you in that direction. The obvious upside of a laptop running Windows is that it will run Windows-based software. A Chromebook (which runs on the Chrome OS) will not. But as more and more apps move to the cloud, this distinction becomes less and less important for more and more users. Even this new crop of Windows 10 laptops is pushing users to the cloud for common tasks like word processing, spreadsheets, and storing files. Can cheap, cloud-centric Windows 10 laptops compete effectively against Chromebooks? For most home users, I think the answer is, “no.” Google’s Chrome OS was designed from scratch for the cloud, while Windows 10 has its roots firmly in the desktop where powerful processors, lots of RAM, big displays, and ample local storage are assumed. Microsoft is trying to put a cow on roller skates. Then there’s the worry-free simplicity of Chromebooks. They boot in less than 7 seconds, while Windows 10 takes 30 or more. There are no software updates to download and install; updates happen on Google’s servers. Minimal system software on a Chromebook means minimal “surface area” for malware to attack. Are You The Ideal Customer? Businesses, educational institutions and government agencies that are heavily invested in Microsoft infrastructure are the best hope for cheap Win 10 machines like the Cloudbook. Developing countries are another target market. A cheap Win 10 laptop might make a good first computer for a youngster; indeed, the cotton-candy colors of the HP and similar laptops suggest that’s what the vendors have in mind. But most college-bound children will want laptops on which they can crunch numbers, play games and watch high-definition videos, not something that looks like it was borrowed from a kid sister. 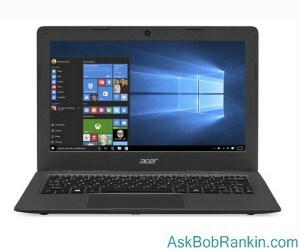 Most recent comments on "Are Cheap Windows 10 Laptops “Chromebook Killers?”"
I bought one of these Acer netbooks, I paid $179 and it has 32G flash storage, but is similar. I agree with Bob, this Acer is no match for a Chromebook online, and the problem is Windows 8.1, which seems to overwhelm the memory very quickly if more than 2 windows are open. The screen res on these Acers is 1280 x 768, adequate for an 11.6" screen. Sounds is cellphone quality, but improves to decent with a cheap pair of phones. It uses a micro hdmi port, so you'll need an adaptor for an external monitor. Battery life is good, about 8 hours with the screen set almost full bright. I am downloading at 25 mbps and have no problems with video performance. These little Acers make decent internet TV's. They run cool and seem rugged. I'm hoping the W10 32 bit upgrade will perform better than 8.1 on this low powered intel processor. In the box I found several discount coupons for various products not related to the netbook. Yours may have different coupons, so I will not comment on their value. Overall, I found Bob's comments about Acer netbooks accurately matched my own experience. Ah, with SSD drives, you can get boot times in three, four seconds, and when running an M2, life is like an eye blink. The Lincoln Nebraska school district is on a multi-year quest to provide every student a computer and an associated curriculum. Their first small test was with Lenovo Yoga's but after further study they now have settled on Google Chrome books. Their thinking is the lower cost, the orientation to the internet which is where the curriculum will be and strong indicators that education and curriculum providers will head in this direction. It is interesting that Apple dominated the education market and Microsoft never could really break in to it and now Google maybe headed in that direction. Bob, Thank you. As always, a thorough and balanced description. 2. What happens if the cloud supplier discontinues the service? This has happened, often, with "cloud" storage of photographs -- most recently Sony's changes to their "Play Memories" service. From my own experiences and for my needs, for an inexpensive (lower end hardware) machine, Chrome OS is the way to go. It is truly cloud-based computing. With the small local storage, you might pay for more cloud storage, but you might not, depending on your habits. In our home, we've moved to more cloud-based computing, but also rely on a local file server (running FreeNAS.) The file server was built from parts left over from an old build I was no longer using. It has plenty of space for all the files and works great. The "client" machines (our daily-use computers) can then be lightweight, inexpensive machines such as Chromebooks. Even with Windows 10, Microsoft is still relying on heavier local computing that requires better hardware to compete with the lightweight Chrome OS. Now that Android apps are going to start being able to easily port into Chrome OS, Chromebooks/boxes/bases will be opened up to even more functionality. I do use Windows on some of my machines, but I think that for lightweight machines, Chrome-based is a better option. Thank you for this review, Bob. Just saw tempting sales for the MS small laptops, and though about purchasing one. Now, I'll either splurge on the Chromebook, or wait a bit longer to see what shows up on the horizon. For a Christmas present last year (2014)My i4 year old granddaughters choice of laptop was a $179 Chromebook. She still loves it. she does all her homework on it, including 1st. year Trig. I have wondered if it was peer pressure that made her choice of machine or if she had researched it? EDITOR'S NOTE: Peer pressure would have made her ask for an iPad. Smart girl. I'm wondering about the term "killer". Why does something have to kill something else to survive? I remember when the "killer app" was the thing that made something viable, but why does this now apply to hardware? I am a tech fan, Chromebooks, Cloudbooks, Android devices, iOS devices, they're all great. For decades, Microsoft and its camp-following developers and retailers conspired for market control-- and as more than one jurist said, in illegal constraint of trade. But scoring both market control and innovation forever eluded Microsoft, whose signature line was only "Me, too!" The 1994 Microsoft computer dictionary did not even include the term "internet". So, why expect market-leading innovation from a "Me, too!" company? Yet, if the real question is whether Microsoft can find monopolist tendencies in its genes, the answer is it certainly can-- Ray Nadella to the contrary. If the stark reality is either survival or rapid decline, count on Microsoft to display all the tricks it has used over the years, some of them equivalent to the trade-hostile practice of "dumping" to level the market in its favor and beat up smaller rivals. While we can salute Microsoft for making the trains run on time, the same compliment once was intended for Italian dictator Mussolini, in an effort to salvage something positive from his dictatorship. The Microsoft dictionary may not recognize it, but the quaint term "Microsoft" is already archaic, and falling out of common usage. I am from India. I need a 2nd laptop. I don't understand why booting speed is so important when the difference is 25 seconds. This is not like the NFL endgame 2 mins. I will buy the Acer Win 10. The laptop I have now is connected to the the internet 24/7/365.